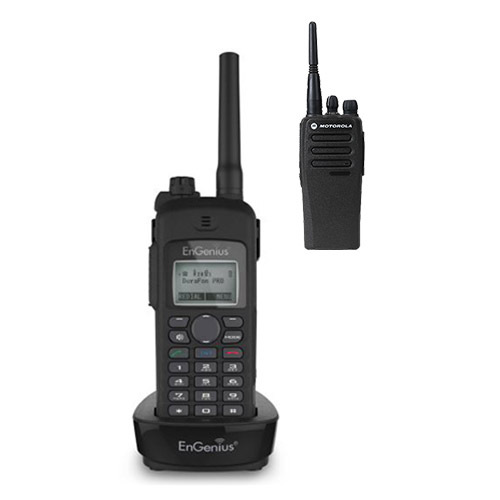 The Engenius Cordless Phone with 2-Way Radio is the only durable, long-range cordless phone with a UHF 2-way radio that allows communication with both UHF 2-way radios and telephone users. The radio that comes with this cordless phone is a 4 watt, on-site, two-way radio that operates on an innovative analog 403-470 UHF frequencies. 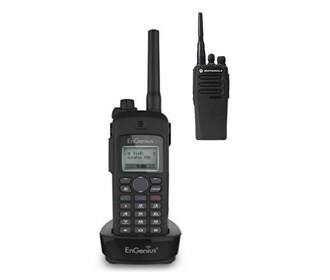 It features DTMF Push-to-Talk ID and a rugged design, which protects the radio from dust, wind, shock and vibration. This bundle is ideal for office workers that need to make and receive calls and want the added convenience of communicating with other workers using UHF 2-way radios. The Engenius DuraFon-UHF-HC w/ CP200D-HK2087 (Single Pack) has many exciting features for users of all types. You can extend the lifetime of your Engenius DuraFon-UHF-HC w/ CP200D-HK2087 (Single Pack) with the purchase of a FactoryOutletStore Factory Protection Plan. See the Engenius DuraFon-UHF-HC w/ CP200D-HK2087 (Single Pack) gallery images above for more product views. The Engenius DuraFon-UHF-HC w/ CP200D-HK2087 (Single Pack) is sold as a Brand New Unopened Item.